As the tagline for the game goes, ‘Every adventure has to pay off’. Ever wonder where the merchant in your game gets his wares? Moonlighter has the answer to that! 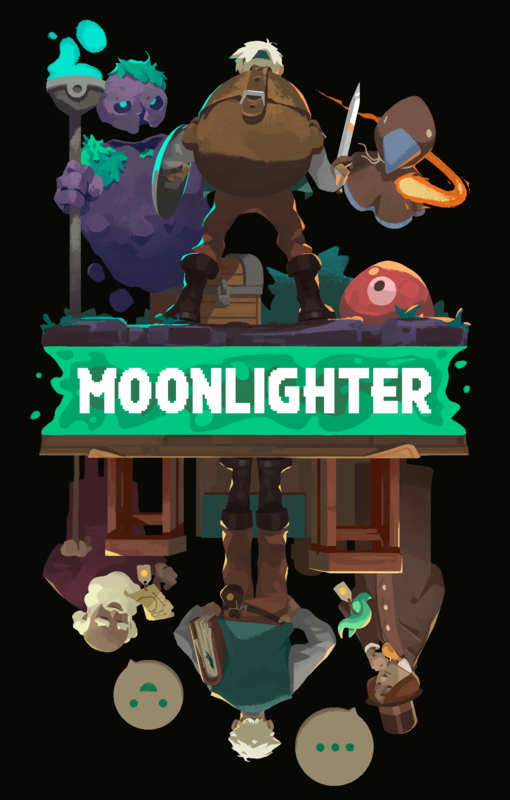 Development studio Digital Sun made the right choice in teaming up with 11bit Studios to get Moonlighter the attention it deserves. This game is a rogue-lite action role-playing game that has the protagonist, Will; a shopkeeper who dreams of becoming a hero. During the day Will spends his time managing his shop, engaging with the townsfolk to figure out their needs, but at night? That’s when the fun begins and we get an entirely different game altogether. The night phase reminded me a lot of The Binding of Isaac where you go from randomly generated room to room in search of treasure. Moonlighter’s day phase has you setting up shop adjusting prices to what you’re selling and also let’s you visually inspect what customers think of your pricing as well. Maybe it’s too high? Perhaps another shop has it for sale for less? It’s your job to investigate and see what works and what is in demand. It’s combining two different game types and mashing them into one that just works. During the night you venture off into Gates which take you to another world. There is a story that goes along with this involving relics and such which I would rather leave for everyone to experience themselves while playing the game. Within that story, you are told how you can switch between worlds in order to bring forth whatever treasures you might have found on your voyage. The thing with this is that it will cost you gold to do so and as a shopkeeper, do you really want to spend your hard earned money? Some highlights have to be how the weapon system will work out. Do you enchant and sell a sword or do you wield it yourself and risk it for a better reward down the line? There are many decisions the shopkeeper has to make but while playing you never stop to think about their storyline! Also, something quick to mention, using the broom to clean up shop and then doubling it up as a weapon is by far one of the coolest video game experiences I’ve ever had. I don’t know why but in that moment I had a massive smile on my face. Good job Digital Sun! Finally! Acknowledgment to the working class of the video game world. The work of a merchant is no joke. To us gamers, they magically keep their stores fully stocked, but now we know the truth. When we turn off our games and go to sleep they go out there and do work. True Moonlighters. It makes me appreciate what they do that much more. I can’t help but think about the troubles my favorite merchant from Resident Evil 4 went through to provide me products (in exchange for monetary value). Respect. 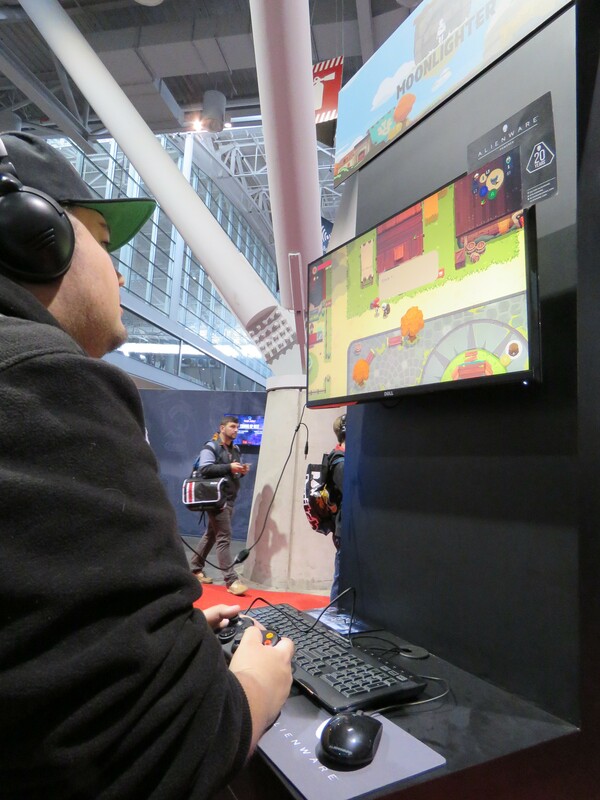 Moonlighter is scheduled to release Q4 2017. Can we also take a moment to praise the amazing Up/Down artwork for the hero! It’s well thought out and explains the game perfectly without the need of words.